The world-famous U.S. Navy Flight Demonstration Squadron — the Blue Angels — is set for a major change following a Monday $17 million contract award. Boeing was awarded the contract to retrofit nine Block 1 F/A-18E Super Hornets and two Block 1 F/A-18F Super Hornets for the team from the current crop of F/A-18C/D fighters. Typically the squadron has a total of 11 fighters, according to information from the Navy. The work will convert the operational Super Hornets with the equipment and tweaks required for aircraft to be used by the demonstration team. 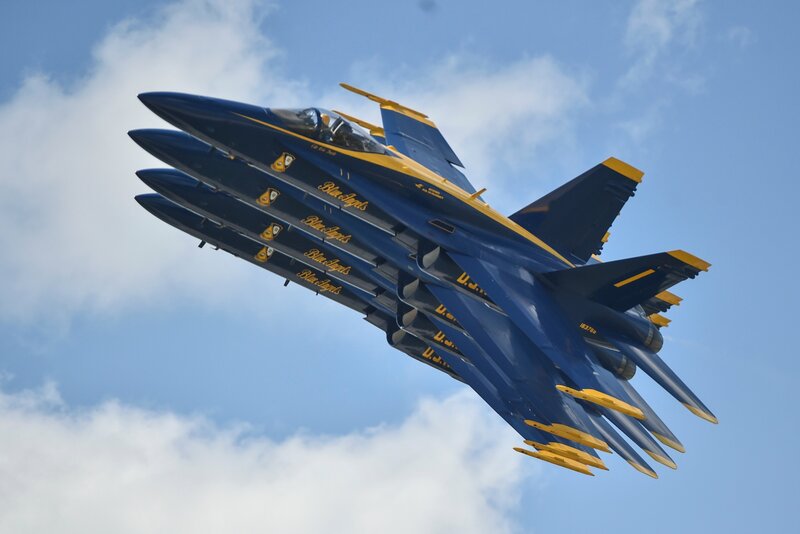 Among the differences between the fighters flown by the Blue Angels and those deployed to the fleet are Blue Angels F/A-18s have their nose cannons removed and replaced with smoke-oil tanks. Old paint is stripped off and the fighters are painted in the distinct blue and gold livery. A civilian instrumentation landing system is put in each plane and each cockpit has a spring installed on the stick to maintain a constant seven pounds of forward pressure to enable improved formation and inverted flying. The upgrades needed to turn a ready-for-combat duty Super Hornet into an elite flight demonstration aircraft, though, are not so simple as plugging in some extra components, USNI News understands. F/A-18 E/F versions do not have a lot of extra space, so finding a place for the smoke system has proved to be a daunting task. The legacy smoke system didn’t quite fit into a Super Hornet nose. In 2016, under a $12 million engineering and design contract, Navy and Boeing engineers started working on solving this issue and others related to reconfiguring the cockpit and installing inverted flight systems, according to Boeing. The Blue Angels’ Super Hornets will be retrofitted at Boeing’s St. Louis facility and is expected to be completed by December 2021, according to the Department of Defense contract announcement. This will be the 11th airframe change for the demonstration team since its founding in 1946. The team transitioned to the F/A-18A/B model on the Blue Angel’s 40th anniversary in 1986 from the Douglas A-4F Skyhawk II.